The Sunday Project suffered a ratings drought last year despite star co-host Lisa Wilkinson spending weeks overseas interviewing celebrities. And the 59-year-old will no doubt be hoping for better results this time around after returning from another international tour. Taking to Instagram on Sunday, Lisa shared her happiness at having returned from a 35,000km-long trip to conduct interviews for the Channel 10 show. 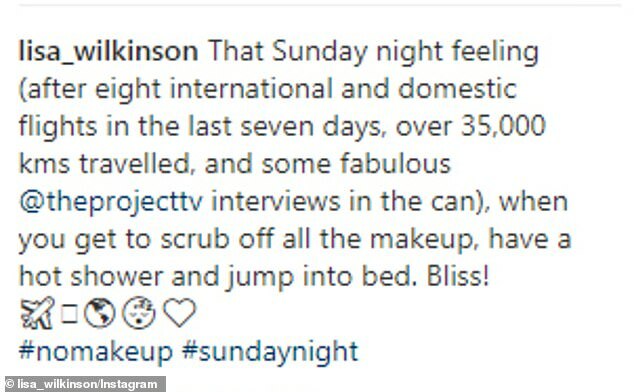 ‘That Sunday night feeling (after eight international and domestic flights in the last seven days, over 35,000km travelled, and some fabulous interviews in the can),’ she wrote in the caption. Lisa was formerly the long-running co-host of Channel Nine’s Today show alongside Karl Stefanovic, and actually interviewed his ex-wife Cassandra Thorburn on The Project last month. During a somewhat awkward interview, Lisa asked Cassandra about her ‘memorable year’, and the children’s author replied that she was in a ‘happy’ place after her divorce was finalised. In late 2017, Channel 10 offered Lisa a rumoured $2million contract to anchor its new weekend show, The Sunday Project. But in September 2018, it was revealed that Lisa still hadn’t delivered ratings success – despite embarking on numerous overseas trips interviewing celebrities. According to OzTam ratings at the time, the Sunday Project fell to thirteenth place in the prime time slot, with just 312,000 metro viewers tuning in. By contrast, a solid 481,000 metro viewers had tuned in to watch Lisa mark her territory on the show eight months earlier, in January. The Project has had success more recently though, with Channel 10 confirming an uptick in viewers following the Christchurch massacre. On March 26, the network announced the previous night’s exclusive interview with New Zealand Prime Minister Jacinda Ardern brought the highest average audience since July 2018. Speaking to WHO magazine following a bout of particularly disastrous ratings in April 2018, Lisa insisted she wasn’t focusing on the numbers. ‘In the end, I just want to do good work and the rest will follow,’ she said. ‘We’re bedding down particularly The Sunday Project at the moment and working out the best mix for the show and one of the wonderful things about going to The Project is the trust that people have in the journalism. She flew to Las Vegas in February 2018 to interview Celine Dion, before jetting to New York in April that year for a one-on-one chat with Amy Schumer. She also travelled to Britain the following month to cover the Royal Wedding of Prince Harry and Meghan Markle. Clearly bitten by the travel bug, Lisa also took holiday leave to embark on a European getaway with her husband Peter FitzSimons in August of last year.